Show two cups to be empty. Suddenly, one cup becomes full of salt. You display the salt by pouring it from cup to cup. All of the salt vanishes without a trace, and changes into a white silk handkerchief. Real salt magically appears from an empty cup. The salt then vanishes completely and transforms into a bright white handkerchief, making this the perfect trick to perform at a party or for large groups. Most props used in magic illusions capitalize on making maximum use of a secret space that is hidden by means of an optical illusion. Body parts (or entire bodies) can be hidden inside of such secret compartments that go unnoticed by the audience, enabling magicians to perform many types of effects. By minimizing the appearance of a secret compartment, it is possible to produce a multitude of objects from an apparently empty location, and also to vanish objects in the same way. "Salt Cups" is a form of ‘production magic’ that was developed while contemplating how many secret compartments could possible be built into a simple-looking object. This handling was created by professional magician Mr. Shiomi, a former magic dealer. Secretly palm a sugar cube in your right hand. 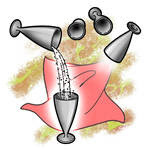 Hold one of the Salt Cups in your left hand, and display to your audience that the interior of the cup is empty. Grasp the mouth of the cup with your right hand and place the cup onto the table, simultaneously dropping the sugar cube inside of the cup. If you time it properly, the sound of the cup contacting the table will cover the sound of the sugar cube as it hits the inside of the cup. Using a spoon, scoop some granulated sugar out of a nearby sugar bowl, and pour it into the Salt Cup. Rotate the Salt Cup in a circular motion several times, and then tilt the cup forwards. Instead of granulated sugar pouring out, your audience will be surprised to see a sugar cube fall out instead.